Home » Learning Center » Gemology » An Introduction to Gemology » What are Allochromatic and Idiochromatic Gems? “Malachites” by Mauro Cateb. Licensed under CC By 2.0. The elements in a gemstone can affect the color we perceive. In gemstones, two large groups of elements can absorb visible light. The transition metal group includes elements such as chromium, copper, gold, iron, and nickel. The rare earth series contains elements such as gadolinium, erbium, and yttrium. 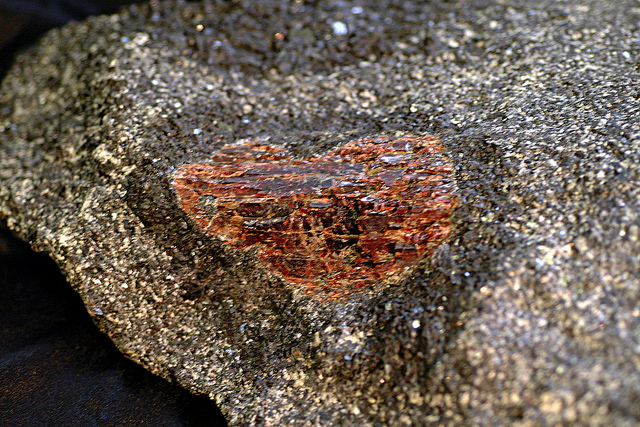 The light spectra not absorbed by the gemstone are transmitted or reflected back to the viewer. We see these wavelengths of light and process them as color. Other factors besides absorption can affect the gem color viewers see. These may include defects in crystal structure, the lengths that rays of light travel through a gem, and differing light sources, such as daylight, fluorescent, etc. 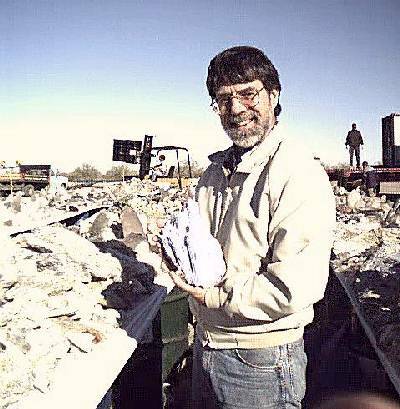 In addition, gemstone phenomenal effects, such as play of color and iridescence, may show colors. Reflections from inclusions inside of gems can also create color effects such as the aventurescence of aventurine and the schiller of sunstone. Gemstone treatments, including heating, radiation, and, of course, dyeing, can also affect gem color. Some gems contain traces or “impurities” of light absorbing elements. They act as chromophores. They aren’t essential parts of gemstone chemical structure, but nonetheless play a key role in coloration. Gems that receive their color from impurities are known as allochromatic. In their pure state, these gems would be colorless. On the other hand, some gems contain color causing elements which are essential to their chemical structure. These are known as idiochromatic gems. Such gems are never found colorless. The coloring elements are essential to their composition as unique gem species. While allochromatic gems may occur in various colors due to the presence of different trace elements, idiochromatic gems only occur in a single color. The beryl family includes gems such as green emerald, pink morganite, and blue to blue-green aquamarine. The chemical formula for all these varieties of beryl remains the same: Be3Al2Si6O18. Trace elements in beryls create these color varieties. Thus, beryl is allochromatic. Without any trace elements, beryl would appear colorless, a variety known as goshenite. 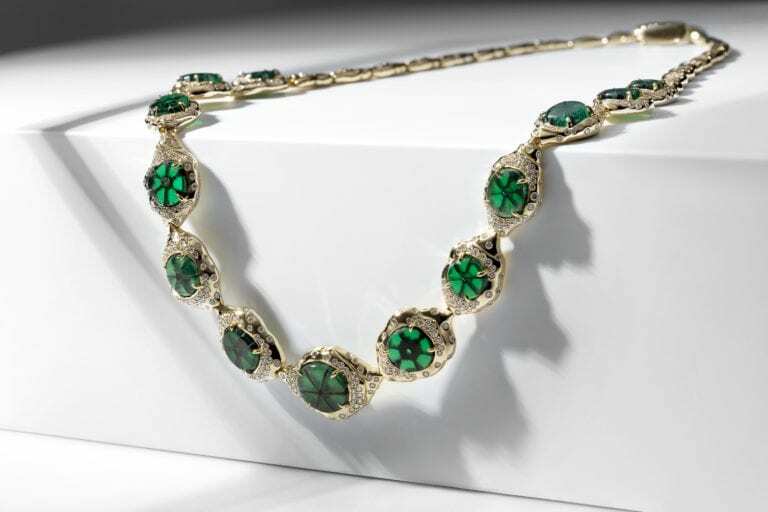 Chromium (Cr) or vanadium (V) creates green for emeralds. 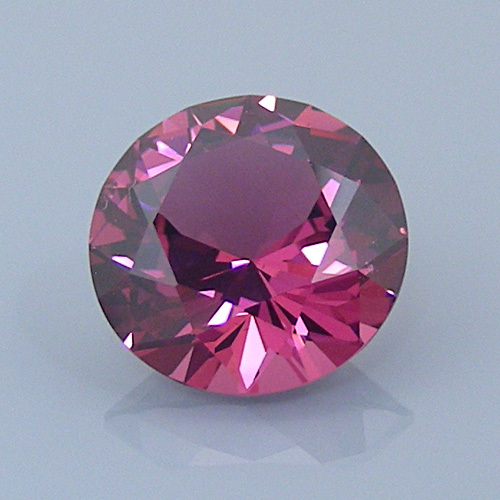 Manganese (Mn) creates the pink of morganite. Iron (Fe) colors aquamarine. However, the presence of the same trace element in different allochromatic gems doesn’t necessarily cause the same color effect. For example, chromium traces in beryl make emeralds green. In corundum (Al2O3), chromium traces create the red color of rubies. (Pure corundum is colorless. Other impurities in corundum cause the many colored varieties of sapphire). Although an allochromatic gem’s coloring agent is a trace element, other factors can still affect the color viewers see. For example, iron’s oxidation state can affect the color it imparts. Ferrous iron (Fe2+) usually gives a blue or green color. Ferric iron (Fe3+) usually gives a yellow or brown color. (The oxidation state affects how iron bonds to neighboring atoms in the crystal). Most well-known jewelry gemstones, including quartz, spinel, topaz, and tourmaline, are allochromatic. “Spinel Ring 1a” by derrico_jewelry. Licensed under CC By-SA 2.0. Some gems occur in only one color. 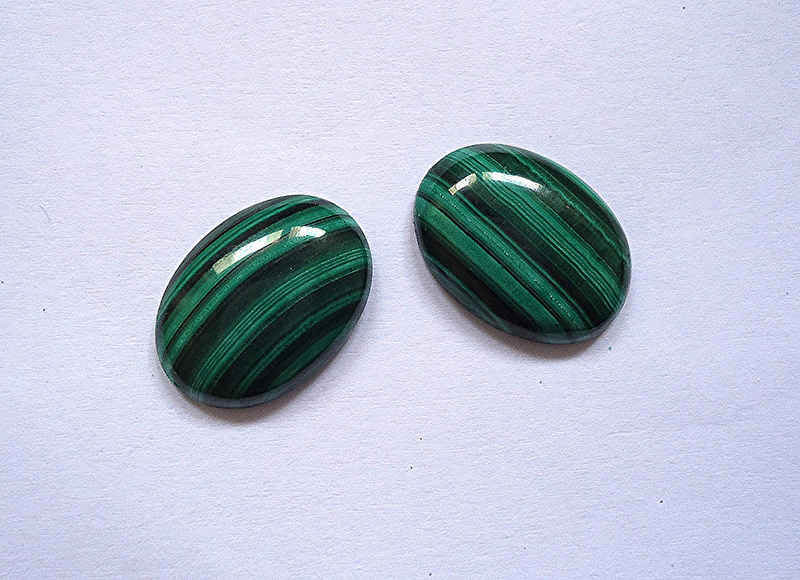 For example, malachite is invariably green. The element copper (Cu), its coloring agent, is an essential component of its chemical formula: Cu2CO3(OH)2. 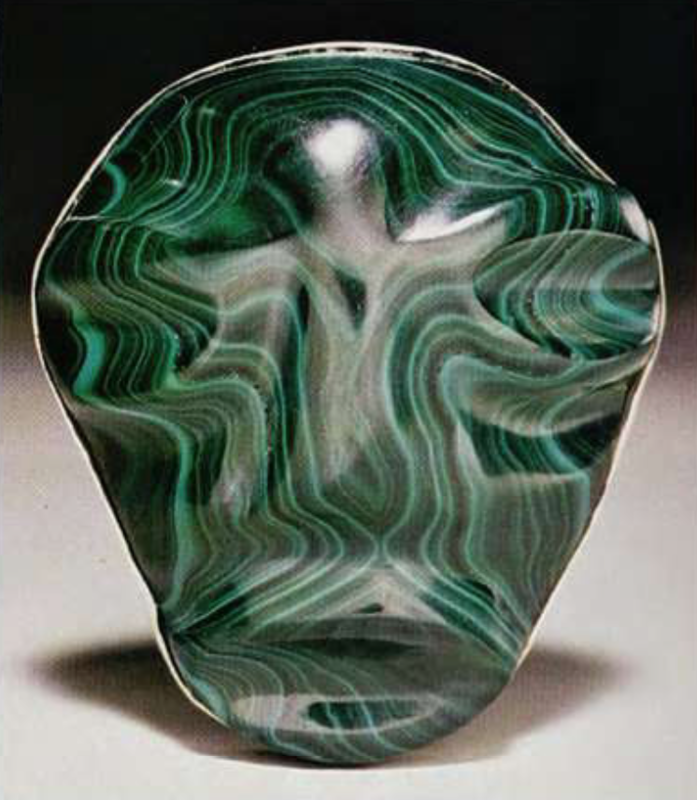 Thus, malachites are idiochromatic gems. However, the presence of the same essential element in different idiochromatic gems doesn’t necessarily impart the same color. 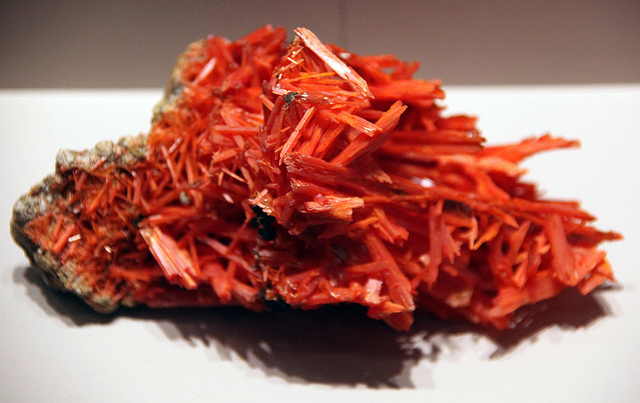 In the rare gemstone cuprite (Cu2O), copper causes a red color. In turquoise (CuAl6(PO4)4(OH)8·4H2O), copper causes a blue color. Just as in allochromatic gems, other factors in addition to the coloring agent can affect the color we can see in idiochromatic gems. 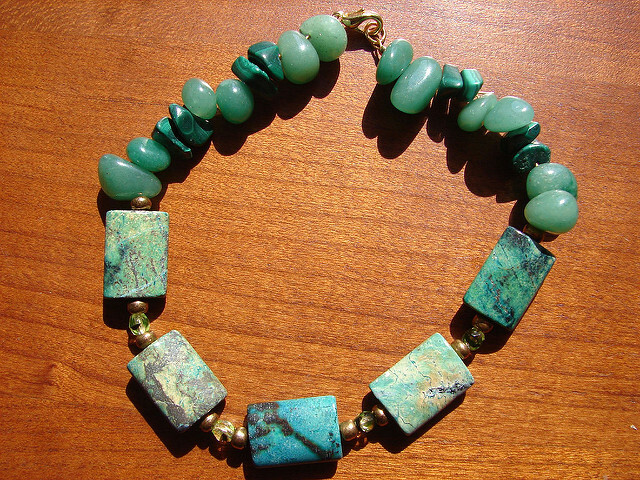 “Malachite, Aventurine, and African Turquoise Bracelet” by Julie. Licensed under CC By-ND 2.0.